To this day, the company continues to follow this strategy. 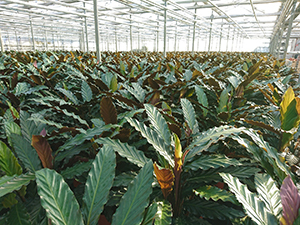 “We introduce Swirskii-System directly after taking the cuttings and keep feeding the predatory mites until the plants leave our premises,” explains Matheusen. “Due to the presence of swirskii, the thrips don’t get a chance to develop and we no longer have control issues. To tackle soil insects and the Duponchelia caterpillar, Damsigt employs the Atheta-System involving the predatory beetle Atheta coriaria. The team find the BT product Delfin® a good alternative. Damsigt has not only had good experiences with Biobest biological pest control, but also with plant-strengthening products such as Bluestim®. Containing the natural substance glycine betaine, Bluestim® promotes more effective water management and protects plants from stress.